Make sure you purchase the right battery for your smartphone. Batteries are not compatible between different brands, and often not among phones within the same brand. It’s recommended that you use original LG K10 batteries. Which battery do I need for my Samsung LG K10 smartphone? 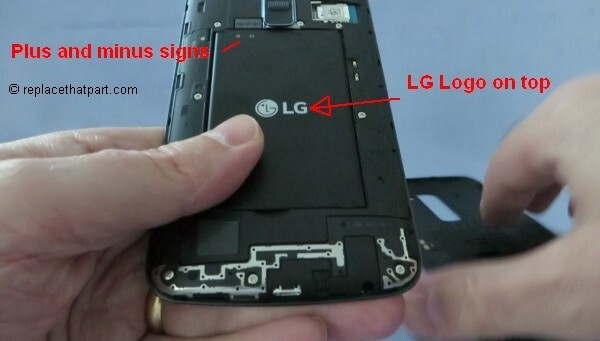 For your LG K10 smartphone you need a a lithium-ion rechargeable battery (sometimes called a Li-ion battery or LIB): Genuine OEM Original LG Li-Ion Battery 2300mAh BL-45A1H. 1. Turn off the power so that you won’t lose any stored information. If the device is on, press and hold the Power/Lock Key on the back of the phone until the Phone options menu appears. Tap Power off in the Phone options menu. Tap OK to confirm that you want to turn off the phone. 2. Remove the back cover. 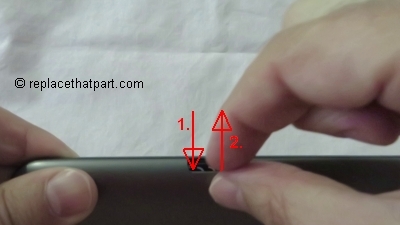 Hold the device in one hand and find the small notch that will help you to release the cover. It’s on the the bottom-right corner of the phone. 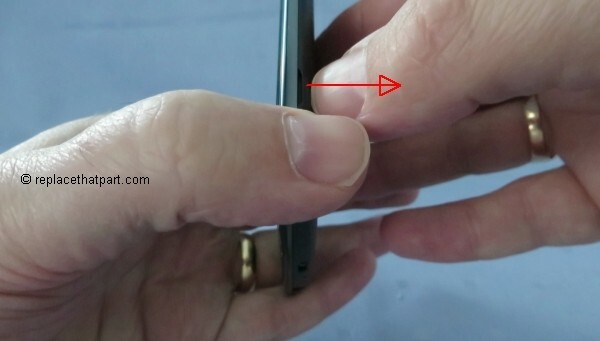 Insert a fingernail into the notch. Lift upwards gently to pop the phone open. Working from the bottom-right corner upwards and then lifting the back cover seems to work well. Be careful not to damage your fingernails when you remove the back cover. Also, be certain not to bend or twist the back cover excessively. Doing so may damage the cover. Take the old battery out. 3. 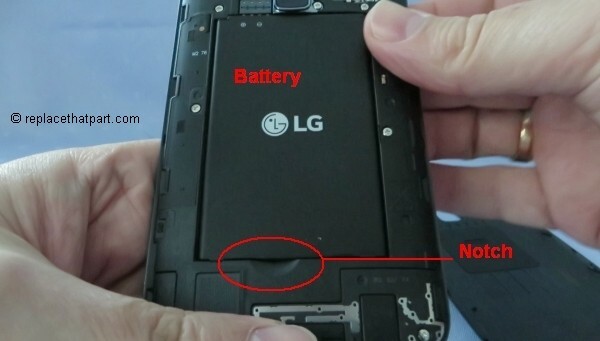 Using your a nail or finger, lift up the current battery via the small notch at the bottom of the battery compartment and lift the battery out of the phone. The battery ought to pop out smoothly. 4. Remove the new battery from its package. 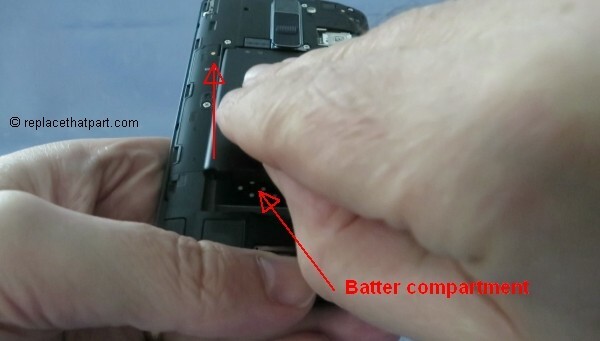 Be careful to touch only the black plastic on the battery. 5. Turn the new battery if necessary. The LG logo should be on top. 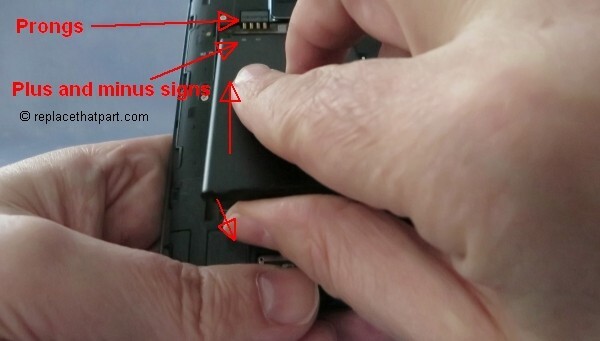 Align the plus and minus signs with the four prongs on the upper-left side of the battery slot. Slide the battery into the battery housing cavity and press down gently to secure it in place. It should fit easily and exactly. 6. Replace the back cover. 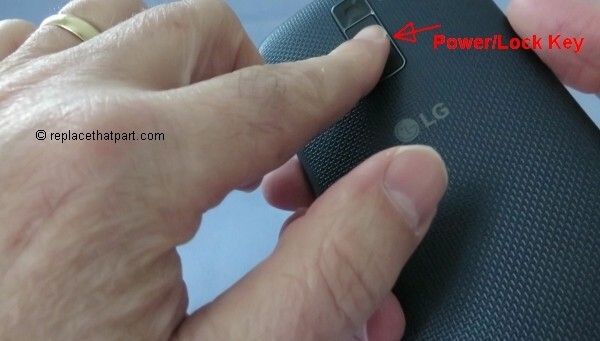 Line up the hole above the LG logo with the rear camera lens and the power button. Gently press the cover down and around the sides of the phone until it clicks into place. 7. Press and hold the Power/Lock Key on the back of the phone for a couple of seconds until the screen turns on and enjoy the new power! Make sure you purchase the right battery for your tablet. Batteries are not compatible between different brands, and often not among tablets within the same brand. Which battery do I need for my Samsung Galaxy Tab 2 7.0 tablet? 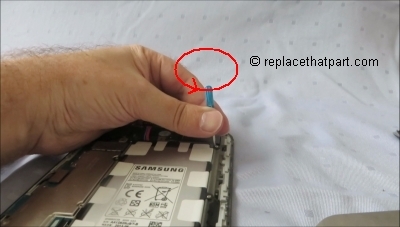 For your Samsung Galaxy Tab 2 7.0 you need a a 3.7V/4000mAh lithium-ion rechargeable battery (sometimes called a Li-ion battery or LIB): Generic Battery For Samsung P3110 Galaxy Tab 2 7.0. To be sure you purchase the right battery, check the exact model number of your tablet as the same device (e.g. Samsung Galaxy Tab 2 7.0) can have several different model numbers. In Android: Apps > Settings (gear icon) > About device > Model number. Some replacement batteries come with tools to open the tablet. If not, you might consider purchasing a special opening and pry tool kit separately, like this one: New Repair Opening Pry Tools Screwdriver Kit Set for iPhone 3G/ 4S / 4 / iPod / iPad / Samsung / HTC . First, remove the memory card (if you have installed one) and turn off the power. 1. Ensure that the device is not currently accessing the memory card. Do not remove a memory card while the device is transferring or accessing information, as this could result in loss of data or damage to the memory card or device. 2. 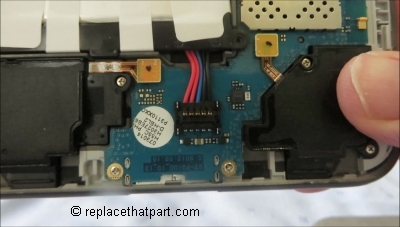 Before removing a memory card, first unmount it for safe removal. In the application list, select Settings > Storage > Unmount SD card > OK.
3. Turn off the power so that you won’t lose any stored information. If the device is on, press and hold the power button on the right side of the device and then tap Power off. 4. 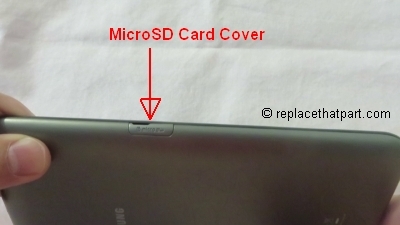 Locate and open the microSD card cover on the left side of your device. Use your finger nail to gently pull the cover out and turn it upward. 5. Push the memory card gently inward until it disengages from the device. 6. Remove the memory card. Removing the back cover, even with the tools provided, is quite difficult when you consider how easy a phone’s cover removes. Be patient and careful. If you’re in a hurry, you might damage the device or even injure yourself. Removing the back cover might take 10 minutes or more. 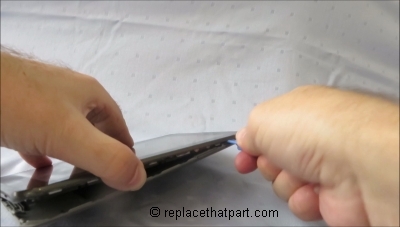 Prepare your tablet by placing it upside-down on a flat surface with some form of soft padding. – Plastic Opening Pry Tool. – Potato peeler. Use this with care and only if you do NOT succeed in creating the first open space between the front and rear panel using other special tools. 7. 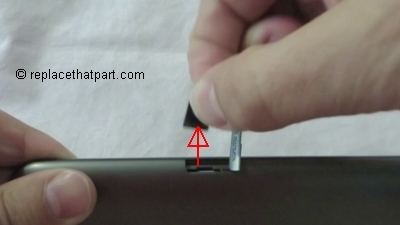 Insert one of the plastic opening tools and carefully pry around the tablet to separate the front and rear panels. There are clips on the back panel you will need to release while you moving around the tablet. Apply pressure to separate the clips that hold the back cover and the rest of the device together. You may need to go around the device several times carefully applying force for it to come apart. If you do NOT succeed in creating the first opening, use a potato peeler for this (at your own risk). Be patient and careful. If you’re in a hurry, you might damage the device or even injure yourself. Removing the back cover might take 10 minutes or more. Congratulations! Once you have removed the back cover, the most difficult part of the job has been done. Now you can remove the old battery. 8. The battery has a cable with a connector. 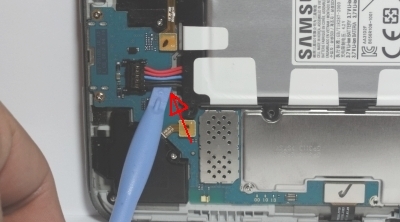 First remove the connector from the board by placing a plastic opening tool under the wires and gently prying it straight up out of the socket. 9. Using the Phillips precision screw driver remove the six screws holding the battery in place. 10. Now you can simply remove the battery from the device. Just lift it upwards and pull it away from your device. Once you have removed the old battery, the rest of the process is easy. 11. Simply hook your new battery’s connector back into the port from which you just extricated the old battery. When you are placing in the new battery, it helps to connect the socket first or else it becomes difficult to properly align once the battery is in place. 12. Put the screws back in. 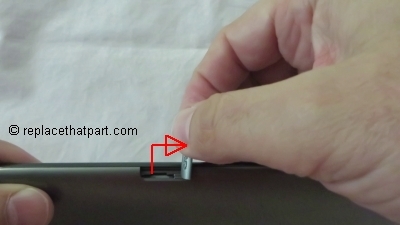 Some people have reported that the frame holding the battery was not exactly compatible with their tablet. The screw holes did not match up 100% with the screw slots in the device. In that case you can try to make it fit, replace one or two screws slightly slanted or even abstain from using one or two of the screws. 13. Replace the back cover. Line up the hole above the Samsung logo with the camera lens. 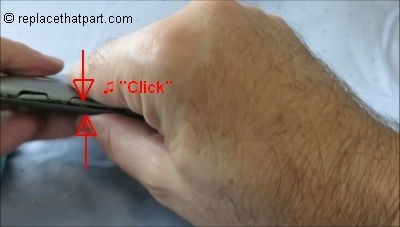 Press the cover down and press around the sides of the tablet firmly until it clicks into place. 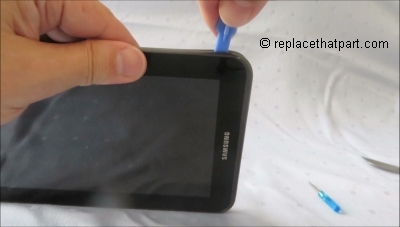 Now, put your tablet upside-down on a flat surface with some form of soft padding and apply pressure until it clicks. 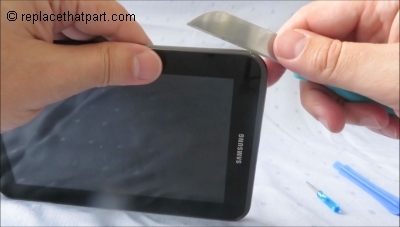 Your tablet should now be closed completely and should look like it did before. 14. Press and hold the power button to turn the device on and enjoy the new power! Make sure you purchase the right battery for your Smartphone. Batteries are not compatible between different brands, and often not among phones within the same brand. It’s recommended that you use original ALCATEL ONETOUCH batteries. Which battery do I need for my ALCATEL ONETOUCH PIXI 3(4) Cell Phone? For your ALCATEL ONETOUCH PIXI 3(4) Smartphone you need a a lithium-ion rechargeable battery (sometimes called a Li-ion battery or LIB): Alcatel TLi014A1 Battery, 3.7V 1400mAh. 1. Turn off the power so that you won’t lose any stored information. 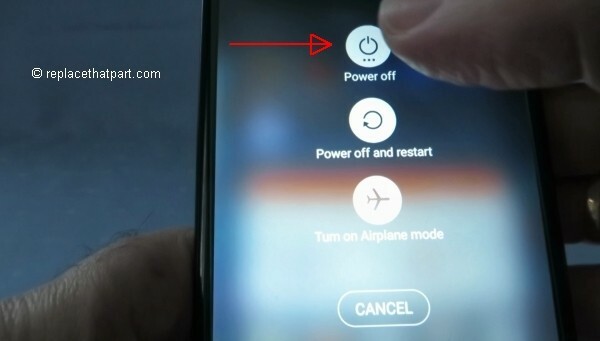 If the device is on, press and hold the power button on the right side of the device and then tap Power off. 2. Remove the back cover. 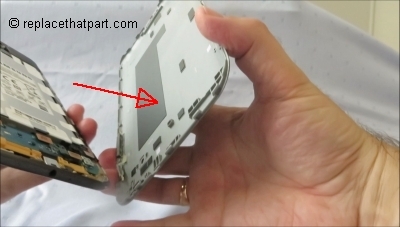 Hold the device in one hand and find the small notch that will help you to release the cover. It’s on the the bottom-left corner of the phone. 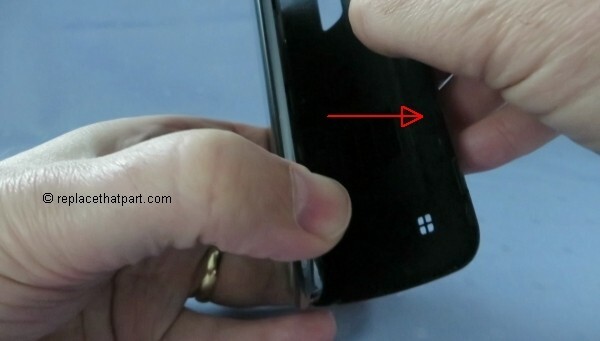 Insert a fingernail into the notch. Lift upwards gently to pop the phone open. Working from the bottom-left corner to the bottom-right corner and then lifting the back cover upwards seems to work well. Be careful not to damage your fingernails when you remove the back cover. Also, be certain not to bend or twist the back cover excessively. Doing so may damage the cover. 3. Take the old battery out. Using your nail or finger, lift up the current battery via the small notch at the top of the battery compartment and lift the battery out of the phone. The battery ought to pop out smoothly. 4. 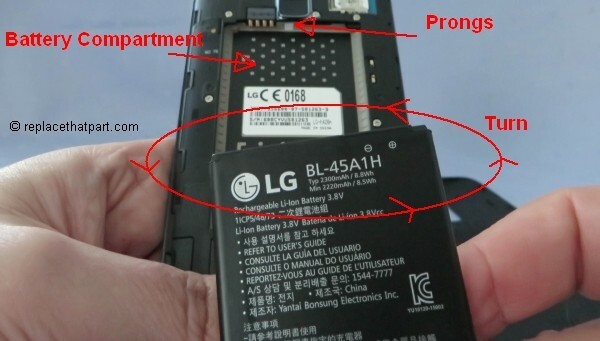 Install the new battery by aligning the three contacts with the three prongs on the bottom-right side of the battery slot. Use the small white arrow for help. Slide the battery into the battery housing cavity and press down to secure it in place. 5. Replace the back cover. Line up the two holes above the Pixi logo with the rear camera lens and the flash. 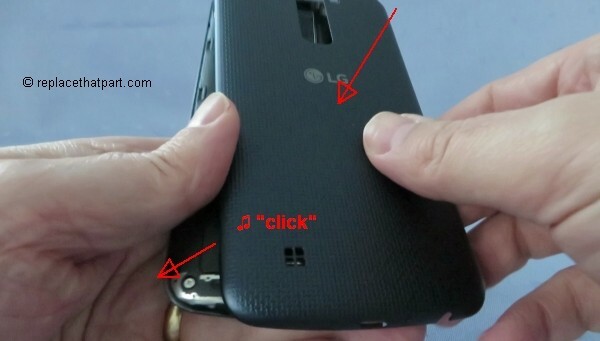 Gently press the cover down and around the sides of the phone until it clicks into place.